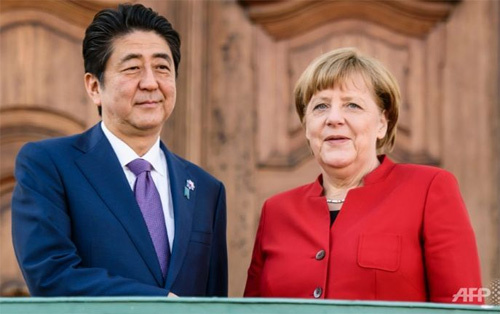 German Chancellor Angela Merkel and Japanese Prime Minister Shinzo Abe last Wednesday (May 4) disagreed on how best to kick-start the global economy ahead of a G7 meeting this month. While Abe made a characteristic pitch for large-scale stimulus spending, Merkel suggested Germany was already doing enough, pointing to the extra economic activity brought by the arrival of one million refugees and migrants last year. The leaders of the major European and East Asian export powers will outline their competing visions when Japan later this month hosts a meeting of the G7 advanced industrial countries - also including Britain, Canada, France, Italy and the United States. Abe - known for his "Abenomics" attempts to stimulate economic growth through increased public spending - has been rallying G7 member nations to make a pitch for jointly providing a boost to the global economy. "We spoke about the global economic situation and that we cannot just wait for normal economic cycles but have to proactively tackle the risks to rejuvenate the world economy," he said. Abe said that at the summit the G7 "will, as leading G7 powers, discuss and make a good contribution to world economic growth. That means that we have to send a concrete message with a united voice." 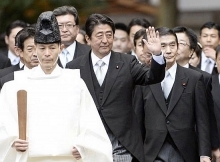 Abe came to power in December 2012 vowing to rejuvenate the world's third-largest economy by ending deflation - a debilitating decline in consumer prices that has suppressed spending for years. His eponymous "Abenomics" policies include the Bank of Japan buying massive amounts of government bonds and introducing a negative interest rate..
Abe stressed the importance of currency stability, adding: "We are watching currency markets and if needed we need to act. "/.